Tomatoes! We all love them but you need to anticipate that disease issues can quickly arise. Now is a good time to review common disease and environmental issues that may arise with the tomato plants. Some issues may be in the form of foliar diseases or even environmental mayhem, so it's a good idea to keep in mind some examples of what to look for and what options are available for treatment. Early blight is not overly common but on occasion you will see it. This disease affects the stems, leaves and fruits while being most prominent on the leaves. The symptoms consist of dark, sunken, leathery spots on the fruit. The disease is exacerbated by humid weather conditions above 75°F. Control of this disease consists of providing good air circulation to plants, avoiding watering late in the day while watering near the base to keep water off the foliage, and application of fungicide sprays. Lastly, make sure to plan ahead on rotating the next year's tomato plants to a different area while raking up this year's plant residue. 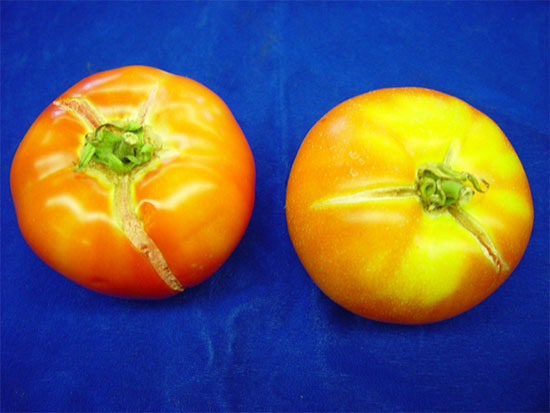 Early blight symptoms on Tomato fruit. 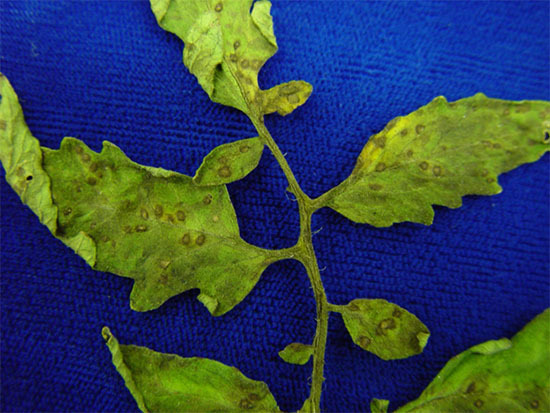 Late blight is a devastating fungal disease. Leaves exhibit a green/brown or black water-soaked area originating at the tip, and the fruit causing a gray/green water-soaked spot that becomes brown and eventually covers half the fruit. Moist weather can cause a white downy mold along the margins of the underside of infected leaves. Unfortunately, plants that are infected will ultimately wither and die. Controlling this disease is similar to the strategies of Early Blight; provide air circulation, avoid watering late while keeping water off foliage, and apply fungicide sprays. 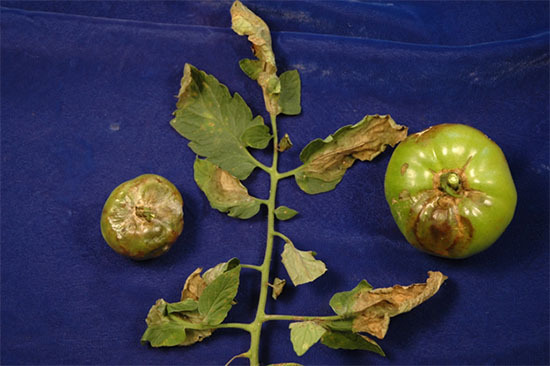 Tomato fruit and foliage showing symptoms of late blight. Leaves to develop circular patterns of gray water-soaked spots with black borders. Small dark specks will develop within the spots. If the spotting is too severe, the leaves will die and fall off, subjecting the fruit to sunscald. The best control method is prevention while treating with copper spray or biofungicide helps to lessen symptoms. Prevention examples are; rotating crops, providing good air circulation, keeping water off foliage while watering, etc. Emphasis on don't water from above. Lesions of Septoria leaf spot on Tomato. 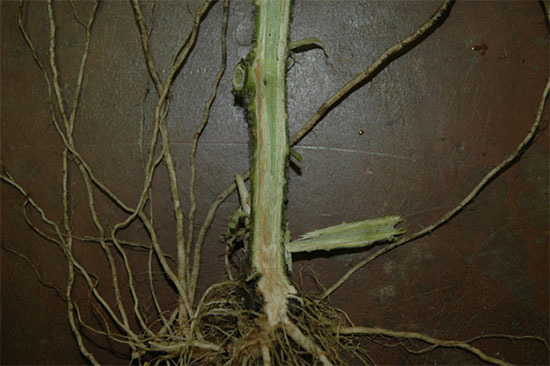 Fusarium wilt is a soil-borne fungal vascular wilt that causes yellowing, wilting, and dying of leaves starting from the base of the plant moving upward. Symptoms usually occur during the time of fruit set but can happen throughout the duration of the plant's growth. 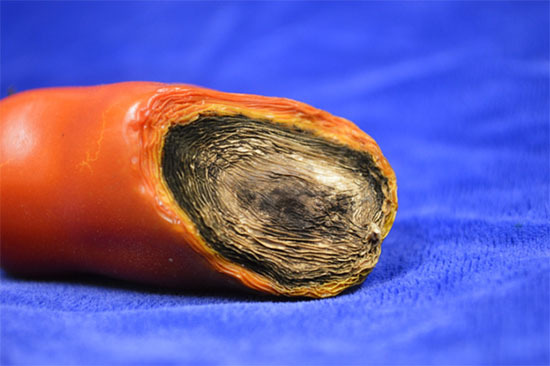 This disease is exacerbated by warm weather with soil temperatures around 80°F. Prevention is key when it comes to this disease. Removing infected plants immediately, planting resistant varieties and rotating to a different location next year are all viable prevention methods. This disease is also a soil-borne fungus that causes a vascular wilt , leaf yellowing, and dying of the leaves. Most typically, one side of the plant is affected first. The leaves will ultimately drop, opening up the fruit to sunscald. This disease tends to be exacerbated by cooler weather temperatures. eventually leaving the fruit small and only the leaf tips green. Prevention strategies for this disease are similar to that of Fusarium wilt; remove infected plants, plant resistant varieties, and annually rotate to different locations. Vascular discoloration due to Verticillium wilt infection. Hot, dry winds with day temperatures above 95°F and night temperatures above 70°F can reduce or prevent fruit set. Nothing can really be done about this aside from keeping the plant healthy; water, fertilize, and mulch. Dry periods followed by sudden summer rain or even erratic watering can cause fruit cracking. Cracks tend to appear on the sides of the fruit; however the fruit are still viable. To prevent cracking, water on a regular basis and apply mulch to keep moisture in the soil. 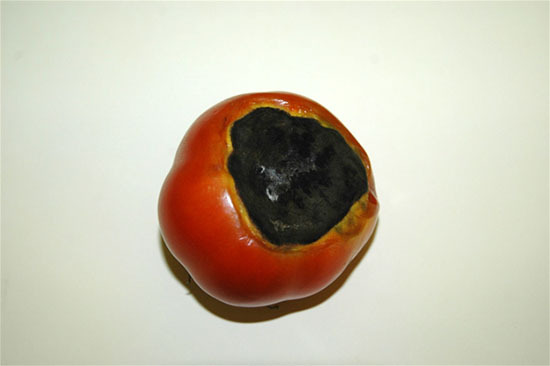 Characteristics of Blossom-end Rot are dry, sunken, leathery rot on either the blossom end of the fruit or on the bottom. This disorder tends to affect the early maturing fruits more prominently. Ultimately, this disorder is caused by calcium deficiency tied with lack of moisture. Pruning plants and over-cultivation around the plants tend to make them more susceptible. This condition is exacerbated by long dry periods while the plant is undergoing vigorous growth. Prevention relies on a uniform watering schedule about once or twice a week depending on weather while using mulch to retain moisture. Fruit suffering from this disorder are generally not usable. Blossom end rot on tomato fruit.